Only some hours ago, Al-Jazeera TV published an interview with Al-Qaeda's No. 3, Mustafa Abul-Yazeed. Abul-Yazeed already became known as the chief financial officer of Al-Qaeda. Like No. 2, Ayman Zawahiri, he originally came from Egypt where he had been jailed over the assassination of former Egyptian president Anwar Sadat. Let's remember: It was Sadat who once chased away the Soviets from their naval base near Alexandria and who began peace talks with Israel. Even though, that might have won him enemies enough, it was his attempt to come to peaceful terms with the Egyptian "brotherhood" of militant Muslims which finally broke his neck. After he had been murdered during a military parade, by soldiers who suddenly turned the cannon of their armoured vehicle towards the president's seat, it was the new president Mubarak who took revenge on the Muslim brotherhood and established his own dictatorship, stabilized by a status quo between Egypt and Israel and friendly relations with all U.S. administrations to come. Years later, men like Zawahiri and Abul-Yazeed who had already survived persecution and torture in the post-Sadat era, finally became the heart and backbone of an Islamic terror organisation, called Al-Qaeda, under the guidance of their spiritual leader Ousama Bin Laden, an offspring of a wealthy and politically connected Saudi-Arabian dynasty who had become fed up with the hypocrisy of his social class. Now, Abul-Yazeed is showing up on TV, and what he tells us about a possible "peace with the U.S." which he would not totally exclude, sounds like an Islamic treatment of infidels during the Middle Ages. If they can't decide to surrender to the Muslimic faith, after having given up all actions against the Muslimic community and after a decade of ceasefire given to them for consideration, they would either have to pay a "tax" for unbelievers or become again engaged in warfare with the army of Allah. Well, to me it seems as if there are some people in the remote mountains of Central Asia who have been there too long . Just another argument for the Western Alliance to withdraw their troops. Maybe such kind of thinking can become contageous with the diastrous results we experienced under the late Bush administration. Leave the people of Afghanistan and Pakistan alone to handle their matters because any interference from abroad will only serve to make things more difficult to them ! What seems to be more dangerous is Abul-Yazeed's stance on Pakistan's nuclear weapons: "By God's will, the Americans will not seize the Muslims' nuclear weapons and we pray that the Muslims will have these weapons and they will be used against the Americans." These words should be seen in the frame of a very short distance between the actual fighting zones and Pakistani nuclear facilities. Even though, nuclear weapons might be well guarded, there's a strong risk of Al-Qaeda using so-called "dirty bombs". Such bombs are nothing else but conventional weapons that have been "enriched" with the dust of uranium minerals coming from the Central Asian "uranium belt". As I earlier described on my Chinese website, there's a high density of uranium deposits distributed all over Afghanistan and Pakistan. Most efficient uranium mines can be found in the war zones of Afghanistan, still held by the Taliban. Others on the Pakistani side are still in use to extract uranium (Southern Pakistan) while others have been closed for fear of Al-Qaeda and their Taliban friends (Northern Pakistan). And, by the way, what else might be Tora Bora, famous stronghold of Ousama Bin Laden during the first chapter of the "war against terrorism", than a fortified uranum mine, most probably built with U.S. help years before. Whatever my readers might believe or not, there's strong evidence about that anyway. To my mind, that problem can only be solved by a tight international control of the uranium sites in the frame of multilateral treaties, profitable to the peoples of Afghanistan and Pakistan and serving the reconstruction of their countries. Such, every interested member of the international community like China and Japan could take part in the exploitation of uranium without resorting to political hypocrisy. This would make sense as it cannot be denied that nuclear fuels will still be needed by many nations to ensure their energy supply during the first decades of the 21st century. 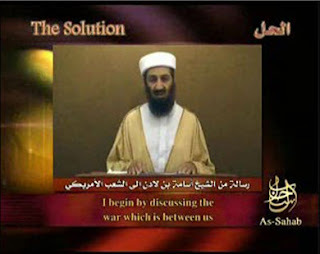 On that distributed tape, Bin Laden accused President Obama and his Pakistani colleague for organizing the military campaign that engaged Pakistani forces against the Taliban, those who are now being suject to bloody fighting in the Swat valley, when they enforced the prohibition "of applying Islamic Sharia law in case of murder and slaughtering." And he said that the Obama administration "is sowing new gossip of hatred against the U.S. that is being spread among a multitude of refugees and victims from Swat valley and from the tribal regions of, both, North and South Waziristan." And he added that "it was detesting when Obama put confidence, once again, into following the old footsteps (of his predecessor) which outraged all Muslims, increased the number of resisting enemies and founded the basis of long lasting wars." left 11 dead and 50 wounded, foreigners included.